Embark is hitting pause on our regular programming to discuss a topic that impacts every organization, no matter its size or industry -- employee recognition. We spend the majority of our waking hours at work, so it only stands to reason that a healthy and satisfying work environment is absolutely critical to an individual’s productivity and an enterprise’s ultimate success. Employee recognition is an irreplaceable part of that larger equation. As you might already know, Embark places its people and culture at the very center of its decision-making process. In fact, we’ve written extensively in the past on the building blocks of our culture, what makes us unique, and the steps Embark takes and tools it uses to ensure our work environment continues to inspire, innovate, and challenge our people. Suffice it to say, employee recognition is a key component of what we do, and something we take very seriously. The way we see it, when both management and peers recognize individuals for their successes, strengths, and values, it inspires them to continue the trend, leading directly to a healthier culture and innovative environment as well as lower attrition and accompanying costs. So what exactly are we getting at? Employee recognition is vital to your workforce, workplace, and success, a notion we at Embark won’t hesitate to discuss whenever given a chance. As the old saying goes, numbers don’t lie -- just ask your auditors. But we digress; simple statistics can paint a comprehensive image of nearly any concept or idea. That notion rings true for employee recognition and why it matters so much to an enterprise. When management and coworkers take the time and effort to recognize the work of others, it creates happy employees. And happy employees are, on average, 12% more productive than others that can’t quite seem to turn that frown upside down. See where are we going with this? Employee recognition has a cascading, lasting effect on an entire organization. From a leadership perspective, 90% of managers that promptly express their appreciation and thanks to their staff experience greater levels of trust from their employees. Conversely, less than half of workers that receive no recognition say they trust their managers. Obviously, both the impact and importance of employee recognition roll downhill within an organization. Therefore, it’s imperative for management to lead by example and foster a culture that embraces recognition, infuses into every team and department, and promotes it amongst peers as well. 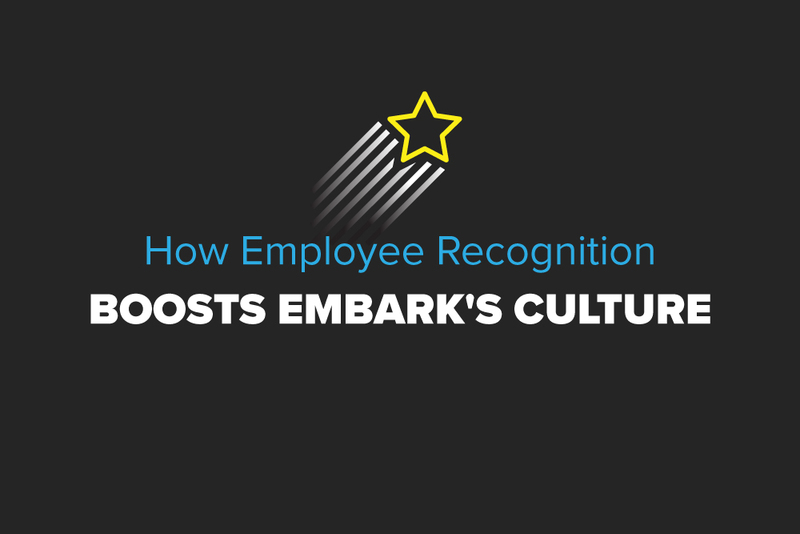 Now that we’ve discussed the importance of employee recognition and how it can boost an organization’s culture, we thought it best to mention a best practice or two that we at Embark have taken to heart. We want recognition to be an integral part of everything we do, from the daily routine to our biggest projects and all points in between. Therefore, Embark needs a way to readily ingrain those ideals into our culture so, for that very reason, we use the Bonusly platform to add convenience and impact to our efforts. Granted, every workplace is different, so what might work well for Embark might not for another organization. However, it’s tough to find any fault with what Bonusly brings to our culture at Embark. If you’re unfamiliar with the platform, Bonusly gives every employee -- Embarkers in our case -- a monthly allowance they can use to recognize coworkers and thank them for putting our core values into action. The Bonusly system uses hashtags to drive recognition and visibility over the named core value -- #intelligent, #relationships, #witty, #clutch, #disruptor, #strategic, or anything else pertinent to our culture, vision, and value system. When an employee is recognized through Bonusly, they can use the Bonusly cash they earn with several different retailers, Embark-branded clothes and gifts, or even lunch with our founder. It’s convenient, extremely effective, and endlessly useful in continually integrating employee recognition into the workplace and, thus, driving the unique culture that is so vital to what makes Embark, well, Embark. With attrition costing companies anywhere between 30% and 200% of an annual salary to find, train, and ramp-up a replacement, it makes even more sense for organizations to do whatever they can to retain the talent they already have. Couple that notion with the enduring impact recognition has on corporate culture and a pervasive, innovative spirit running rampant through the workplace, employers are best-served adopting policies and systems that reinforce the intrinsic value of employee recognition at every possible turn. At Embark, we take our own advice and, lo and behold, it’s made all the difference.